This set of Five Poker Dice features 5/8" white opaque Poker Dice in a blank or Custom-Imprinted Velour / Velveteen Bag or a Blank or Custom-Imprinted Oval Dice Cup. The Velveteen Dice Bags measure 3" x 3", and they feature a drawstring top to keep the dice securely in each bag. You can choose from the following Dice Bag colors: Black, Burgundy, Hunter Green, Navy, Red, Royal Blue, and Silver with a Gold, Silver, or White Imprint. Each Oval Plastic Dice Cup is available in black and brown. The Black Custom Oval Dice Cups measure 3-1/8" tall, by 2-7/8" long (side to side), by 1¼" inches deep (front to back). Our Brown Imprinted Oval Dice cups are 2-13/16" tall by 2-15/16" long by 1-5/8" deep. Poker Dice Set Bag pricing includes the Dice packed in the Bags. 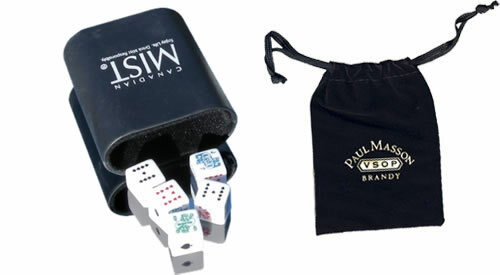 Poker Dice Set Cup pricing includes the Dice packed in the Dice Cups in zip top bags. Bags: 2" x 2" (1 side imprint only) Dice Cups: 0.625" x 1.10"